Home > Hindu Issues > Western Influence > Celebrate New Year on Gudi Padwa instead of 31st December > When actually should we celebrate New Year? There are many theories regarding the creation of the Universe, such as the Big Bang theory, the Proto-universe theory, the Inflationary theory, the Bubble Universe theory, etc. Out of these the Big Bang theory is most widely accepted by the scientific community. According to this theory, the big bang occurred almost 13.8 billion years ago and the Universe came into existence. In a Hindu Scripture, the ‘Chandogyupanishad’, it is said that the Supreme God (Parameshwar) made a sankalpa (resolve) ‘I am one, I will manifest in several forms’, and the Universe was created. The calculation of the number of years since the creation of the Universe as well as the number of years till the dissolution of the Universe has been done by the Sages in India. Sage Vasishtha has mentioned that the creation of the Universe happened 34.5 billion years ago. 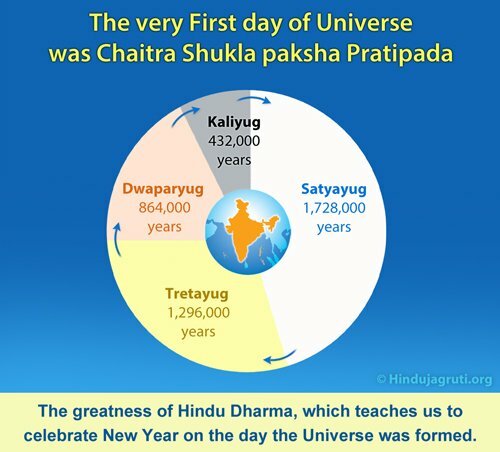 The creation of the Universe happened on the Hindu Calendar Date (tithi) of Chaitra Shukla Pratipada. Thus, the Hindu calendar begins on the sunrise of this tithi. This date usually falls on any day from late March to mid-April on the Gregorian calendar. The time span has been divided into thousands of years, called as Yugas. There are four Yugas in total. The total number of years of all these four Yugas is known as a Mahayuga. When a Mahayuga is multiplied by 1000, it is known as 1 kalpa. At the end of each kalpa, the Bhulok (Earth region), Bhuvarloka (Nether plane) and Swargaloka (Heaven) are dissolved and new creation begins. When Deity Brahma’s lifespan culminates, there is complete dissolution of all creation and new creation begins. Currently, 50 years of Deity Brahma have passed and we are in the 51st year of Deity Brahma’s lifespan. B. Manvantars of this kalpa have been completed while the 7th (Vaivasvat) is taking place. C. The Vaivaswat Manvantar comprises of 71 mahayugas of which 27 have been completed. The Satyayuga Tretayuga and Dwaparyuga of the 28th Mahayuga have been completed, and we are in the Kaliyuga. D. The first part of kaliyuga comprising 5116 years has passed and this Gudipadwa / Yugadi will signal the start of the 5117th year. 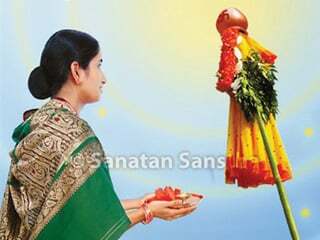 E. To specifically calculate the year that starts on this Gudipadwa / Yugadi. 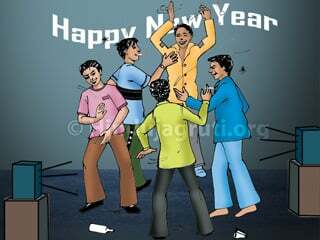 So celebrate your 15,55,21,96,08,53,117th new year on 21st of March, 2015 ! The above information highlights the greatness of Hindu Dharma. 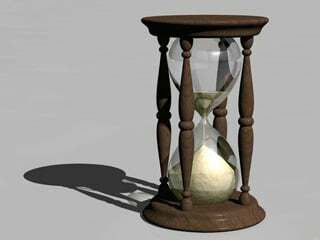 Indian Sages have calculated the exact time span since the creation of the Universe and have also studied when the dissolution of this creation will occur. They have also told us the exact day when the creation of the Universe happened. This is just one example of the greatness of Hindu Dharma; like this, there are many examples where we can learn about the greatness of Hindu Dharma. Being a follower of Hindu Dharma, naturally this will make us proud of our Hindu Dharma. If we compare the above with the history of December 31 or January 1; it will be clear that Hindu Dharma’s information has been derived after in-depth study by the Sages. Hence, celebrations of December 31 or January 1 have no spiritual significance. 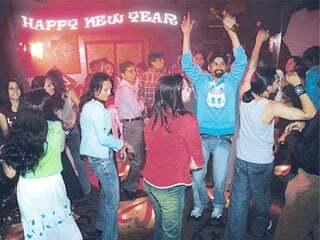 Therefore, let us celebrate New Year on the tithi (Hindu Calendar Date) Chaitra Shukla Pratipada, instead of celebrating December 31 as New Year’s eve and January 1 as the New Year.